A Visual Query Builder component to design SQL queries via an intuitive visual interface. An SQL Query Parser to build an SQL query object model of any given SQL query. An SQL Text Editor with code completion and syntax highlighting. A highly-customizable SQL Query Text Formatter. A powerful SQL Query Builder API to modify existing and create new SQL queries by the code. A set of components to build feature-rich data browsing UI with data filtration, sorting and pagination. A set of helpers to connect to different databases and execute SQL queries against them. Active Query Builder supports dozens of database servers and various generic SQL standards. Active Query Builder is ideal for SQL professionals who need to get data for ad-hoc reports or extract data from an external DB whose structure is not known beforehand. Active Query Builder gives end users a clear view of their queries and database schema. It lets them instantly see the structure of a given query and start thinking about the result data, not the query. It is the ultimate helper for everyday work with SQL queries! With users expecting better and better interfaces to deal with complex data retrieval, Active Query Builder has allowed me to provide a highly professional, robust environment to both novice users and skilled query writers. The interface of Active Query Builder is familiar to most database users. Users build queries mostly by mouse clicks and drag'n'drop operations. Active Query Builder helps users to build SQL queries by giving them advice on object references, keeping away from common errors and warning them about problems. When working with Active Query Builder, the user thinks about the data s/he needs to get, not about the correctness of SQL syntax. Visual query builder lets users design queries with sub-queries on separate tabs, edit their texts separately from the main query and preview the sub-query results. Active Query Builder gives a clear view of your database schema to end users. It helps users find the needed objects and fields, and browse relationships between objects. Active Query Builder lets you give friendly aliases for objects and fields. It allows you to group objects by subject area, defining favorite objects. With Active Query Builder you can replace real objects with improved versions, add calculated fields, and hide unwanted ones. Active Query Builder can parse SQL queries of any complexity and build visual diagrams. The ability to parse SQL queries allows you to browse them visually, and understand and analyze their structure. Users can preview the results of subquery execution to get an idea of what data it brings to the main query. They can edit the subquery text separately from the entire query without fear of ruining the whole query. Active Query Builder is a true two-way query builder; the end user can switch between visual query building to SQL text editing at any time. Changes made to the query text are applied to the visual diagram and vice versa. The advanced SQL text editor with code completion and syntax highlighting makes SQL text editing convenient for professional query writers. SQL text formatting lets you touch up SQL query text to improve readability. When browsing result query data, users often need to change sorting, apply filters, and calculate totals. These are essential features for building a convenient interface to work with data. 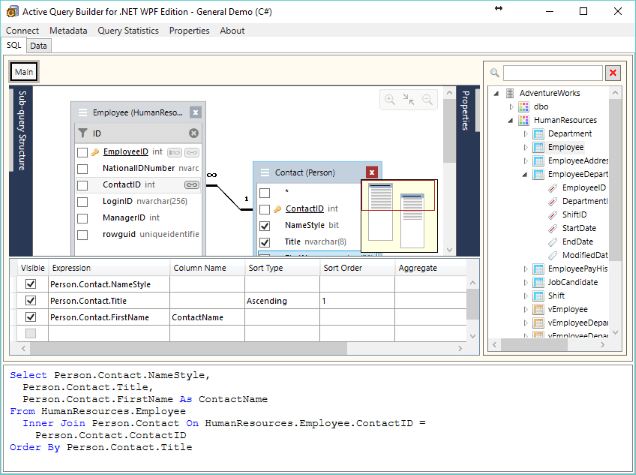 Active Query Builder provides an API and accompanying visual SQL filter builder control to perform these operations on a query. The API also helps build a paginated data browsing interface. Active Query Builder can load database schema from various DB connections and custom data sources. You can define filters for metadata to get rid of unwanted objects or remove them one by one. You can fill database schema by code when working with a custom data source or a web service. The component can work without a live database connection by loading metadata from a pre-generated XML file reducing the database server load and speeding up the component initialization. Active Query Builder gives you full control over user queries. It lets you parse SQL queries and get information about used database objects and fields. You can perform in-depth SQL query structure analysis, edit user queries, or create SQL queries from scratch. By analyzing user queries, you can deny the execution of unwanted queries or add necessary conditions to prevent unauthorized access to data. Active Query Builder shows the list of parameters used in a query, along with information about the fields of database objects to which they are applied. Active Query Builder's SQL Parser supports dozens of SQL dialects: Oracle, MS SQL Server, Azure, MySQL (MariaDB), PostgreSQL (Redshift), SQLite, MS Access, InterBase, Firebird, IBM DB2 (incl. AS/400), Informix, SAP IQ, SAP SQL Anywhere, SAP ASE, SAP Hana, SAP Advantage DB, Netezza, Teradata, Pervasive (Actian Zen). It correctly handles the subtleties of each supported SQL dialect. When working with parsed queries, Active Query Builder keeps every single query clause used during the query building process with no losses. As it's compatible with ANSI SQL/92, SQL/89, and SQL/2003 standards, Active Query Builder works fine with many other ANSI SQL-compatible database servers, such as Vista DB, Nexus, Elevate DB, Vertica, Progress (OpenEdge), Apache Spark, Amazon Aurora, Amazon Athena, Google Big Query, Cassandra, Impala, and more. You can embed SQL Query Builder into your application with a few lines of code. The Knowledge Base, documentation and numerous demo projects will help you get acquainted with the component in a few days.